An 8–character alphanumeric LCD with user-friendly icons shows a variety of information and operating status such as caller’s name, received message, etc. Select from 5 levels of mic grain, for clearer transmission. For easy access to often used functions, P0-P3 buttons are programmable to meet specific needs. Buttons and LCD display are backlit for night time operation. The IC-F5121D series provides NXDN™ CAI-based IDAS digital mode. It is also compatible with IDAS multi-site conventional and IDAS single-site trunking. The following IDAS features are programmable. 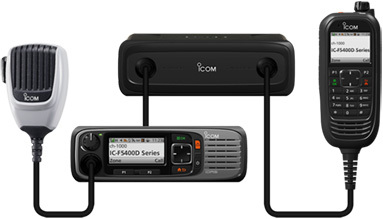 The F5400D series radios is Icom’s new flagship IDAS product. Dozens of new features and functions are included all in one new small form factor size. Features like SD Card, USB interface and Bluetooth appear for the first time in this land mobile product. A brilliant color display allows for easy observation of critical information, in the dimmest of light to the brightest of sunshine. 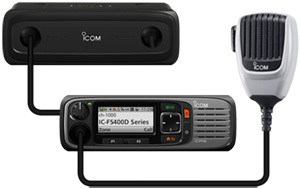 Icom is the choice when you want to take your communications to the next level. The F5400D/F6400D allows the user to configure the radio three ways to suit almost any application or installation requirement. The intercom function is available between controllers and/or COMMANDMIC. The new COMMANDMIC is an identical physical layout and user interface as the F3400D. By installing in into a vehicle it allows a secondary remote control of the F5400D.